Founded in 2005, BOS supports and facilitates activities by sourcing people, materials and equipment for a variety of key customers. BOS has the support of key manufacturers in the USA and Europe. BOS provides a wide range of essential on-site services, operating to international safety standards, solving logistical challenges and enhancing overall business performance. BOS Group has emerged as a ONE STOP SOLUTION to efficiently cater for a wide spectrum of support services and provide tailor made solutions to the diverse business communities in the various regions of the CIS more specifically in Azerbaijan, Kazakhstan and Georgia coordinated by local management with international support from the UK And UAE. In 2017, the company has undergone appropriate changes in Quality and Environmental Management systems in connection with the transition to new versions of ISO 9001: 2015, BS ISO 14001: 2015, and has been certified by International Certification Authorities for both standards in June of the current year. 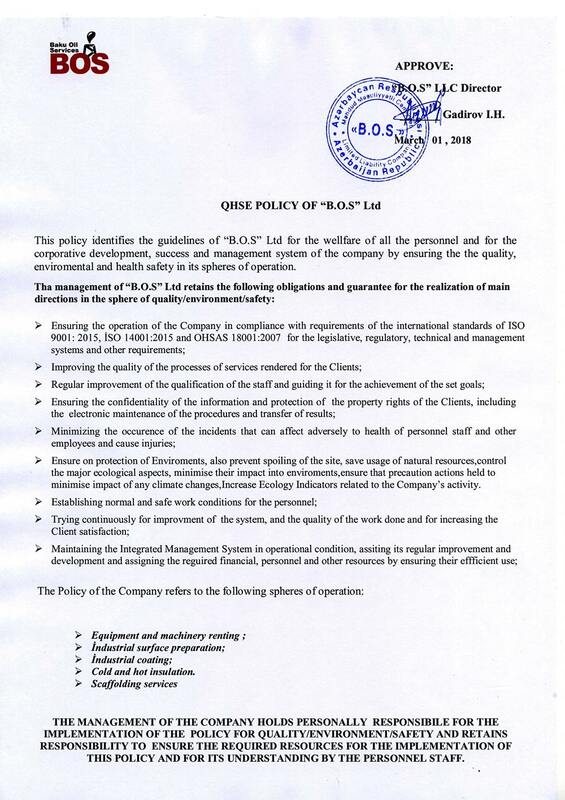 Starting from March 2018, the company has expanded its application of international standards ISO 9001: 2015 and BS ISO 14001: 2015 and OHSAS 18001-2007 Quality, Environment and Occupational Health and Safety Management System, and commenced certification on scaffolding scope of works.